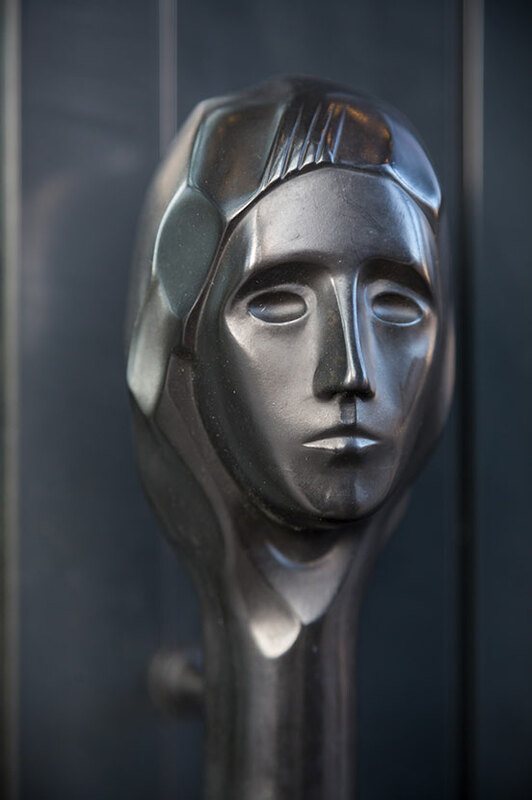 British artist Chris Evans introduces his artwork Portrait of a Recipient as a Door Handle, After a Drawing Produced by an Anonymous Philanthropist, which was produced through a commission from Sculpture International Rotterdam (SIR) and installed at the Blaak 333 branch of the Rabobank in Rotterdam. Also Dees Linders, SIR’s artistic director, explains her organisation's interests in Rotterdam and this particular project. Open! also includes essays on Evans’ work by Tirdad Zolghadr and Marina Vishmidt. 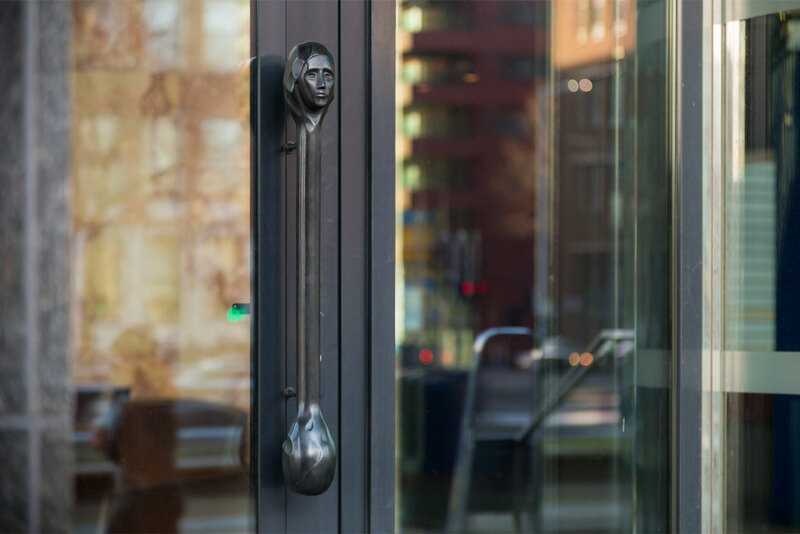 Portrait of a Recipient as a Door Handle, After a Drawing Produced by an Anonymous Philanthropist takes the form of a door handle that is intended to be affixed, as standard, to the entrances of various competing banks in central Rotterdam. 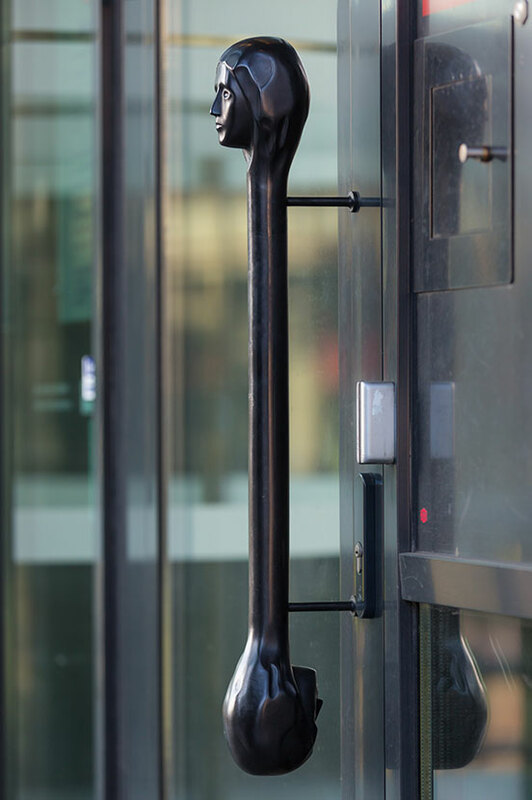 The first handles were installed at the Blaak 333 branch of Rabobank in February 2014. While the work was produced through a commission from Sculpture International Rotterdam, its relationship to third parties who were closely involved in the production of the work and its placement was characteristically unsolicited. A public institution is literally funding a work on the threshold of a company’s private property since the entrances of banks mark a pronounced boundary between public and private interests. The commissioned drawing referred to in the title is by an unnamed philanthropist who was attempting to capture the facial expression of a recipient, of the benefactor’s altruism, who has just managed to overcome the fear of being exploited. This drawing was then made three-dimensional as a doubled motif in the sculpture – looking both inwards and outwards. The work’s first rendition, in 2010, was as an oversized bronze prototype, at a scale of 4:3, displayed in a vitrine. With this particular relationship between scale, materials and manner of display there’s a blurring in the relationship between a ‘model’ and a ‘sculpture’, a speculative object and an artefact. Both the original drawing and the identity of the philanthropist should remain concealed as the sculpture represents a public embodiment of an undisclosed act. If, at an entrance to a bank, we consider the flow of capital through the city, we can think of a philanthropist as having a dual relationship to this flow – both accumulating capital, and, at the same time, redirecting it back into the public domain. When we visit a bank, we might contemplate the contested definition of “philanthropy” and how it operates between acts of mercy or justice, between providing solace to the less fortunate or promoting the development and reform of social institutions. As our hands grasp the door handle, we might also consider the varying responsibilities that characterise public and private acts of benevolence and the related ethical implications. Or, on deciding to either pull the handle towards us or push it away, we may simply be remembering how much or how little there is to withdraw from our accounts. Sculpture International Rotterdam (SIR) is the international Art and Public Space program of the Centre for Visual Arts in Rotterdam. SIR manages a collection of artworks by such artists as Ossip Zadkine, Naum Gabo, Alexander Calder, Franz West, Cosima von Bonin, Elmgreen & Dragset and Erik van Lieshout. In addition, SIR also devises programs with temporary art projects such as the long-term program for the city centre’s main boulevard, the Coolsingel. The aim of SIR’s program is to stimulate an other manner of viewing and thinking about the potential of this complex boulevard. No street in Rotterdam arouses as much discussion as the Coolsingel, which has basically been in a constant state of flux since the early 20th century as a result of various traumatic events such as the 1940 bombing of the city and by a spate of decisions made by the self-appointed city council in its desire for progress and modernisation. The current Coolsingel still mirrors this rich and dramatic past. But what we, on the eve of a new transformation, are experiencing is, for the most part, a boulevard that must be reinvented at the urban development, economic, and social levels. SIR’s long-term plans over the past six years included inviting a number of artists to present designs for artworks that not only address the past and present but also the uncertain future. Chris Evans was approached because of the themes he addresses in his work and the fact that the administrative and governmental headquarters as well as the financial-economic epicentre of the city are located along the Coolsingel. Tirdad Zolghadr and Marina Vishmidt’s essays are based on the lectures they presented at SIR’s mini-symposium in February 2014 on the occasion of the unveiling of Evans’ Portrait of a Recipient as a Door Handle, After a Drawing Produced by an Anonymous Philanthropist. With many thanks to Lisette Smits, advisor for SIR. Chris Evans (born 1967, Eastrington) lives and works in London. Forthcoming solo exhibitions include CLODS, Diplomatic Letters, The Gardens, Vilnius (2014); Clerk of Mind, Piper Keys, London (2014). Recent solo exhibitions include CLODS, Diplomatic Letters, Juliette Jongma, Amsterdam (2012); Goofy Audit, Luettgenmeijer, Berlin (2011); The Cell That Doesn’t Believe In The Mind That It’s Part Of, Marres, Maastricht (2010); I Don’t Know If I’ve Explained Myself, Mala Galerija, Ljubljana (2010); Take A Bureaucratic Bow, Objectif Exhibitions, Antwerp (2009). Significant group exhibitions include: A Needle Walks into a Haystack, Liverpool Biennial (2014), Radical Conservatism, Castlefield Gallery, Manchester (2013), Bourgeois Leftovers, De Appel (2013), Specific Collisions II, Marianne Boesky Uptown Gallery, New York (2013), The Narrators, Walker Art Gallery, Liverpool (2013). In 2012 a monograph on the artist was published by Sternberg Press in conjunction with his exhibitions at Marres and Objectif Exhibitions. Chris Evans is represented by Juliètte Jongma, Amsterdam and Lüttgenmeijer, Berlin. Curator and author Tirdad Zolghadr tries to frame Chris Evans’ new artwork Portrait of a Recipient as a Door Handle, After a Drawing Produced by an Anonymous Philanthropist by de-framing it as well as returning it to its essential materiality and site-specificity. 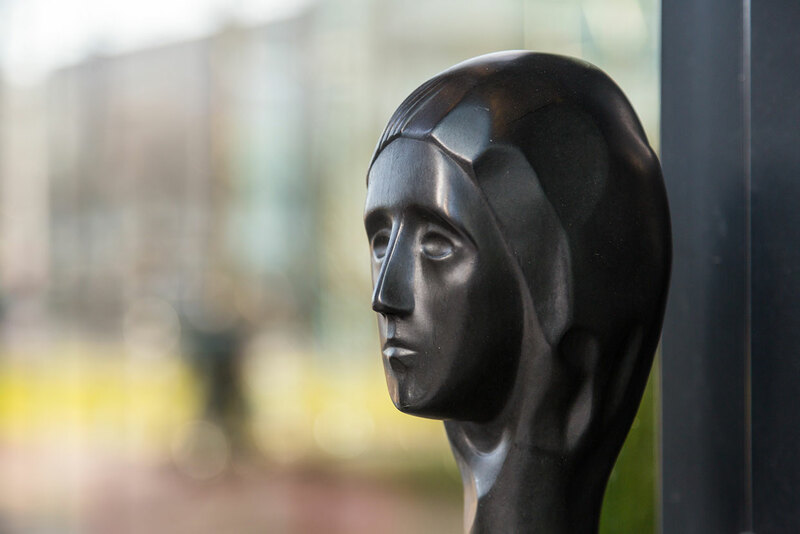 Evans’ work, commissioned by Sculpture International Rotterdam, was recently placed at a local branch of the Rabobank in Rotterdam. Writer, editor, and critic Marina Vishmidt is preoccupied with issues that involve art, labour, and value. She takes up Chris Evans’ artwork Portrait of a Recipient as a Door Handle to elaborate upon Pierre Klossowski’s text Living Currency and to address the notion of people as currency and commmodities and the inherent economies of affect.